The qual­ity of the water in our water­shed is vital to the 9 mil­lion New York State res­i­dents who depend on it for con­sump­tion, and to the peo­ple liv­ing in the water­shed who enjoy and depend on healthy streams. Water qual­ity ben­e­fits the local econ­omy through rev­enues gen­er­ated by fish­ing, white­wa­ter, and other stream-based recre­ational activ­i­ties. Water qual­ity is vital for the plants and ani­mals that share our water­shed, and is part of the nat­ural beauty of this place. While over­all water qual­ity in the Ashokan Water­shed is good, the major water qual­ity con­cern affect­ing drink­ing water is tur­bid­ity. Sec­ondary water qual­ity issues are nutri­ent enrich­ment, inva­sive species, habi­tat alter­ation, and the poten­tial loss of cold water as a result of cli­mate change. There may be impacts from pol­lu­tants that orig­i­nate in stream­side areas, such as fuel oil tanks, sep­tic sys­tems, and runoff from roads. Tur­bid­ity is the cloudi­ness or hazi­ness of water result­ing from sed­i­ment sus­pended in the water col­umn. In the Ashokan water­shed, sus­pended sed­i­ments are mostly clay and silt par­ti­cles that enter the stream through erod­ing stream chan­nels and hill­slopes. Tur­bid­ity is what causes our watershed’s streams to run a reddish-brown or “choco­late” color after heavy rain­storms. The clay par­ti­cles can har­bor viruses and bac­te­ria mak­ing it more dif­fi­cult to effec­tively treat the water for drink­ing use. 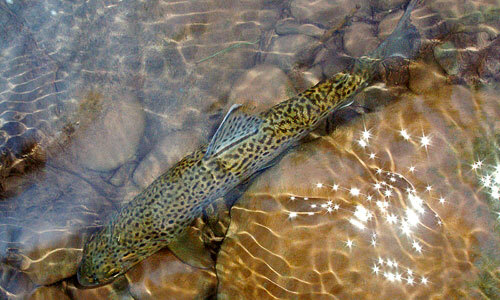 If tur­bid­ity lev­els are ele­vated for long peri­ods of time, it may adversely affect local wildlife such as fish. Local­ized depo­si­tion of the silt par­ti­cles can clog the spaces between rocks in streambeds and reduce habi­tat for aquatic insects. AWSMP addresses water qual­ity issues by per­form­ing stream cor­ri­dor assess­ment to diag­nose stream con­di­tions and iden­tify ero­sion haz­ards and water qual­ity impair­ments. Stream assess­ments sup­port the devel­op­ment of stream man­age­ment plans and pro­vide the data nec­es­sary to com­plete stream restora­tion and sta­bi­liza­tion projects. Geo­logic sources of tur­bid­ity exposed by erod­ing stream banks are mapped and cat­a­logued in com­puter data­bases. This infor­ma­tion is used to under­stand the dis­tri­b­u­tion and nature of tur­bid­ity sources. The results of data analy­sis are used to pri­or­i­tize fur­ther assess­ment or rec­om­mend treat­ment options. AWSMP spon­sors research by the U.S. Geo­log­i­cal Sur­vey (USGS) to mon­i­tor tur­bid­ity and sus­pended sed­i­ment load­ing in sev­eral of the major streams of the water­shed. We are also work­ing with the NYS Geo­log­i­cal Sur­vey to map the glacial geol­ogy of the watershed. A major source of tur­bid­ity in today’s streams is the legacy of sed­i­ment left behind dur­ing the Ice Age. Sed­i­ment deposits are sub­se­quently dis­turbed by erod­ing and unsta­ble stream chan­nels and hill­slopes. While ero­sion and depo­si­tion are nat­ural processes oper­at­ing over large timescales, human devel­op­ment within stream cor­ri­dors can exac­er­bate ero­sion and intro­duce con­t­a­m­i­nants to the sys­tem. The appli­ca­tion of best man­age­ment prac­tices in set­tled areas can help to mit­i­gate these effects. After sites with chronic sources of tur­bid­ity are iden­ti­fied through assess­ments, dif­fer­ent lev­els of man­age­ment inter­ven­tion are eval­u­ated. The options for stream man­age­ment range from doing noth­ing (where insta­bil­ity is caus­ing no prob­lems), to allow­ing nat­ural processes to resolve the prob­lem, to assisted self-recovery and full restora­tion. In some reaches, minor lev­els of man­age­ment inter­ven­tion can resolve an issue, such as ripar­ian plant­i­ngs, slight bank grad­ing, or the con­struc­tion of iso­lated struc­tures. Where full restora­tion of steam func­tion and capac­ity is required, man­age­ment may include exten­sive reshap­ing of the channel’s form. Engi­neer­ing sur­vey, design and con­struc­tion work are required for this level of intervention. Restora­tion and sta­bi­liza­tion projects are designed to reduce the long-term, chronic intro­duc­tion of fine sed­i­ment sources to the stream. AWSMP pro­vides pro­fes­sional ser­vices and fund­ing for the design and imple­men­ta­tion of these projects, work­ing in coop­er­a­tion with landown­ers and munic­i­pal­i­ties. For more infor­ma­tion on com­pleted and ongo­ing restora­tion and sta­bi­liza­tion projects, see the Projects & Fund­ing section.